You are here:Home » Blog » Festivals & Events » Getaway this Easter! If you are looking for that great place to getaway over the Easter holidays, the place that has it all, then take a drive to Broken Head Holiday Park. Where the rainforest and the beach unite to give a you the perfect location to enjoy pristine sandy beaches and beautiful lush rainforests. 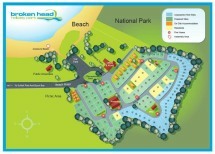 No matter what your preference is we have it all here at Broken Head Holiday Park. Bring your surf board and go for a surf, or if you don’t yet no how to surf and have always wanted to learn how then there are several places in Byron where you can hire a board and or learn how to surf. Just see our staff at reception for more information. Over the Easter holidays there are plenty of acitvites to do for the kiddies also. We have a colouring comptetion ages 8 years and under and over 8 years. There is also a free Easter Colouring book for the kiddies to enjoy. Just ask the staff at reception for more information. And of course of over the Easter Long weekend itself you have the Byron Bay Blues Festival, with head line acts such as Bob Dylan, BB King, Grace Jones, Paul Kelly ZZ Top, and Casey Chambers just name a few. There will be plenty of activities, stalls and competitions to keep everyone entertained. Check out the website for more info www.bluesfest.com.au .